So, recently I announced that my release of Daemonic Love Magick might be my last Daemonolater’s Guide for some time. I want to work on some more advanced books and the 101 has been sucking up too much time. I started that series of chapbooks to answer the most common questions I get in my email. It serves dual purpose – it gets the information out there for those new to Daemonolatry and Daemonic Magick, and it clears out my inbox and maintains my sanity. A friend of mine suggested that perhaps what I should do, instead of writing chapbooks, is just blog more. Take these frequent questions from my email and start answering them here on the blog. So I’ve decided that that’s what I will do with the beginner material for now – resulting in my new monthly blog spot: ASK A DAEMONOLATRESS. The premise is this — you ask the questions, I answer them in a post. It’s a pretty simple thing. So feel free to ask your questions in the comments below, or if you want to remain completely anonymous – send your questions to my email swordarkeereon@gmail.com and put ASK A DAEMONOLATRESS in the subject line. Today’s question: HOW DO I ACTUALLY CONSTRUCT AN ELEMENTAL DAEMONIC CIRCLE STEP-BY-STEP? I AM NOT SURE HOW TO DO IT. So the first step is to clear the temple space. The square footage of the space doesn’t matter, you just need to be able to get around in it so you can face any direction without knocking anything over. Next – mark your cardinal directions (i.e. North, South, East, West). 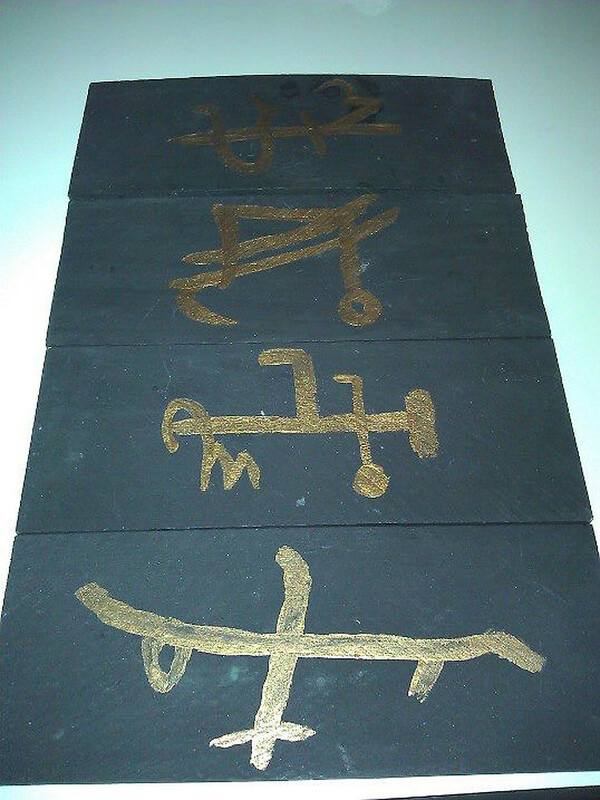 Some Daemonolaters will mark the cardinal points of their temple or ritual space with small placards that have on them the corresponding Daemonic Sigil. After that, there are three ways you can choose to invoke your elemental Daemons. The first option is to start at the North and move clockwise. (Going counter-clockwise doesn’t make it darker, scarier, or more evil – I suppose you could do that if you must.) The second option is to start at your elemental direction (i.e. based on your astrological sign) and work clockwise or counterclockwise from there. For the record, in old-school Daemonolatry — we work clockwise and save the counter-clockwise for closing. The third option is to start at the elemental direction most suited to the work being done and work from there. So, for example, if you’re doing a Rite to Lucifer – start East. If you’re doing a working to draw a lover – start South. Once you’ve chosen where to start, you stand facing that cardinal direction. Then you invoke the Daemon using the ZD sigil (traced in the air with your athame, forefinger/middle finger, or your wand) while intoning, saying, singing, or chanting the corresponding Enn. The following are the enns for the Dukanté elementals. You can replace these with the Goetia Spirit elementals if you choose. To Invoke Earth: Lirach Tasa Vefa Wehlic, Belial. To Invoke Air: Renich Tasa Uberaca Biasa Icar, Lucifer. To Invoke Fire: Ganic Tasa fubin, Flereous. To Invoke Water: Jedan Tasa hoet naca, Leviathan. 5. After all the elemental Daemons have been invoked, you can invoke Satan, your Patron, or the Daemonic force you are working with from the center. That’s it. There are many variations of circle construction. Some rituals have processions where each of the Daemons are invoked with the athame, the incense, a candle, and the infernally blessed water. These tend to be more liturgical rites or more ceremonious, often led by priests, but you can do this as well if you feel like performing a more elaborate ritual. To close, you simple reverse the direction in which you invoked. So you would say thank you and goodbye first to the Daemon you invoked from the center and then back around the way you came, ending with the first Daemon you invoked. HOWEVER – I have actually closed in the same direction I opened – and nothing terrible happened. So feel free to experiment with this. Another one of the big questions I get from readers is if you need an elemental circle (or even a ritual construct) at all. The fact is that you can get away with not bothering with an elemental circle. You can, literally, do Daemonic work “witchcraft style” where you simply carve a sigil in a candle, anoint with oleum and burn. Or just sit down with a sigil and meditate on it – all without a ritual construct. The reason the elemental circle is a part of so many basic Daemonolatry rituals is for BALANCE. Daemonic energy can often be imbalancing for new practitioners. The entire point of the construct is to keep you balanced, and to make your Daemonic guests comfortable. Rituals performed inside Daemonic circles of any type tend to pack more energy – especially if you’re also a Daemonic magician. I hope this short article has made the construction of the Daemonic circle more clear to those who have been having a hard time with it. Again, feel free to ask questions in the comments below, or email me. Tagged ask a daemonolatress, beginner basics, elemental circle, how-to. Bookmark the permalink. Whats your feelings on making a circle with the Angels in the cardinal points as protection? If someone isn’t aligned (sorry I can’t think of a better term) to the daemons Belial, Lucifer etc will the balance them? What protection would a practitioner have against say, for instance, one of the spirits I know you call an ‘other’ turns up to cause trouble? I remember using the Angels as protection and Beleth was just fine with this but told me to knock the whole calling the God names Elohim, Tetragrammaton etc off. I was doing the whole Christian Grimoire thing at the time. I now do what you call the Witchcraft style it works far better than Solomonic evocation. Well, if a person is a Daemonolater they really wouldn’t need the protections, IMHO. If a person isn’t comfortable with the Daemons (and is afraid of them), then no, this method of working may not be for them. That said, if working in a protective circle of angels works for you and aligns with your beliefs, then I don’t see why you can’t do that. You’re right – the angels and other types of Daemons have no issue working with one another. After all, Goetia spirits like Beleth, and Angels, vibrate at different levels, so they may not interfere with one another. I have been wondering the same thing!! Is it necessary though to actually draw the circle and mark the points. Because I don’t know any better I’ve been facing East holding the dagger out in front of me. I then say hail xyz lord and master of light and say my own homemade salute/invocation etc. Hold the dagger in front of me I then turn through south, west and north, and say the appropriate greeting at each point as I go. I continue back through to East, hold the dagger against me and say hail S etc. I then do my thing. I then close by repeating the opening steps but say a simple thank you to each point. The question is – is this not a fully constructed circle ?? Somehow it “feels” at this very early (elementary!!!) stage that the circle that I draw in the air is sufficient. Andy – these are great questions. You do not need to physically draw the circle. For formal rites the points are marked (often for atmosphere), but if you don’t have enough space or are just working on-the-fly, the points don’t have to be marked. Sounds like you have a great system and it’s working for you. So the circle you draw in the air is absolutely sufficient. Will you still be releasing daemonic prosperity magick this month. That is the hope, however I don’t know how long it will take in editing. Long story short – I took on too much again. At the latest, end of the year. At the earliest, probably mid-September. Hello, I have a question, I’ve been trying to read, many times, Kenneth Grant, however, I find the book hard to understand. My question is, do you think his books could be useful in some way or another to a modern Luciferian/Demonolater? If so, in which way/ways? I have never read Kenneth Grant and so I have no advice for this one way or another. Perhaps someone else reading can share their insight on this one. I am a complete non expert and beginner but I have tried to read Kenneth Grant and find him very very difficult. From what I see his books are descriptive of things and do not offer any ritual advice. That being the case I am unsure as to how useful his books are likely to be. Hello, I am currently searching for a “place to call home” spiritually. I came about this website and the Modern Demonolatry book from trying to find out about demon worship outside of just Satanism. In the book a man by the name of Richard Dukante came up, however I am finding myself unable to find many sources about him. Where would be a good place to find out more about him? This is because Richard Dukanté is only known within the small community of long-time Daemonolaters. In retrospect, if I had known how much controversy would have come about over Dukanté and the lack of old books for people to research, I wouldn’t have mentioned him in any of my books at all. But initially, when I began writing about Daemonolatry, I was writing for a very specific, small group of people and never expected our material to go mainstream. That was all accidental. That said, unless Dukanté’s living heirs want to release his notebooks etc… to the general public, I am helpless to change things. However, with the coming revision of The Complete Book of Demonolatry, I will likely just omit him altogether, or leave him as a footnote. When you start getting into familial and specific coven/sect practices, there often isn’t a lot of publicly available information for research, and therefore it should likely just be omitted. I know that now. Back in 1999 and 2006, I didn’t even bother to think that this particular information would be useless to those outside certain groups. Hello, i would like to ask a question regarding placement of my altar(only a mini one at that) during invocations.I am very limited for space and was unsure if you placed it near the circle during invocations with small offerings on or if it could be placed in another room….or do I have the offerings in the circle then place them on the altar once everything is closed down. I am still very new to this and want to get everything correct as not to insult. Hi. How can you learn how to pronounce the enns. I work well with syllable to syllable spelled out phonetically. Even someone saying them slowly so you can pronounce with them. Do you know of any such source? Thank you. I live in the Southern Hemisphere so spring is springing here. I want to do the appropriate rite on the September equinox. According to northern hemispherical lore this would be an autumnal rite to Leviathan. Should my rite be to Lucifer given that in NZ it will be the Spring Equinox on 21 September?? I’ve tried evocation in the past and have had limited success. Just wondering what path you recommend ie starting with elementals then planetary then demons ( a recommended path that I read about) Are there any that are more likely to come than others? Is a demon as likely to come as another entity ? Idk where else to put this so here I am. My stepson had a friend over Halloween night. When they were headed to sleep he pulled a blanket off his top bunk and when he unfolded it out fell what he thought were mouse turds. And he said it was a TON of it. He vacuumed it all up. I never saw it but it didn’t make sense to me. Today I was cleaning up in our computer room which is used ALL the time. There’s a big cabinet in it that I wanted to put stuff in so I was moving things out and reorganizing. I keep 2 ouija boards in it and when I went to pull them out I heard a bunch of what sounded like beads dropping all over.. I at 1st thought it was turds when I looked. But looking closer they were tiny black seeds..A TON OF THEM. So I thought maybe this is what my son saw. It was ALL OVER the ouija boards. I had to vacuum it was so much and I never keep seeds in there! I have no explanation for where it came from. Is this possibly something used in magick? Spirits? And weird thing is I just put one of the boards in there not very long ago. No I haven’t used it in a while nor were these seeds in there at the time. I am a beginner to Demonolatry and while I’m allowed to burn incense in my home, my family’s a bit cautious about open flames. So do I need to use candles in rituals? Can I use fake/electric candles? Or should I wait until I’m allowed to burn them? I think you can use an electric candle. Oftentimes candles, when not performing candle magick, are for illumination only, and to set the right atmosphere in the room. Hello! I was wondering if you could give me some advice? I’ve been looking into demonolatry for about a year, but I hadn’t had any contact until about 2 months ago. I was at a very rough point in my relationship with my parents (with whom I live) and I didn’t know what else to do but pray. So I addressed a prayer to anyone, and asked for the strength to get through the situation. I felt a presence in my room and after a few minutes, my father came in to reassure me that things would be alright.That hope helped me get through all the depression that my fight with my parents caused. I didn’t know who answered my prayer until today. I was on my computer, doing nothing in particular, when I felt the compulsion to draw something. It started out as a goat, but evolved into a goat headed person. When I finished drawing it, the name Baphomet just popped into my head. I meditated on it for about 45 minutes (the longest I’ve ever meditated for. )I kept seeing what looked like a collection of objects, but the image wasn’t clear enough to make out what it was. I also saw a very distinct yellow and purple aura/energy. I gradually faded out of the meditation, but I still don’t know what they were trying to convey. I’m not sure what to do from here. I will definitely be meditating more tonight before I go to bed, and in the next following days, but other than that I don’t know what to do. Any information or advice would be appreciated. Hello, I’m also new to Demonolatry. Someone i know had made an online journal about theisitc satanism and i did some looking and bought one of your books. My question is if I were to do a dedication ritual to an elemental demon would i still be able to worship the same deities i do now?